Daryl was born February 12, 1947 in Flint, the son of Dale A. and Shirley E. (Baker) Miller. 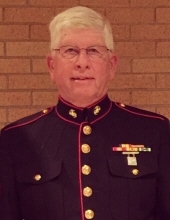 He was a Vietnam veteran serving in the U.S. Marine Corp. He married Christine Louise Ceresia September 6, 1969 at Holy Redeemer Catholic Church in Flint. He had resided in Fenton since 1979 coming from Davison. Daryl retired from GM as a Millwright. He had also been employed as a Iron Worker. He was a member of the Marine Corp. League Flint Detachment. He was a avid golfer; He also enjoyed fishing and traveling. Surviving are: his wife of 49 years, Christine; sons, Nathan Alan (Andrea) Miller of Hartland and Dale Thomas (Sarah) Miller of Cedar; grandchildren, Gabrielle, Halaina, Anniston, Molly, and Edgar; sister, Jule (Weymouth) Kamakana of Hawaii, mother-in-law, Madeline Ceresia of Linden; sisters-in-law, Carol (John) Whaley of Fenton, Nancy (Tom) Miller of Linden, Patti (Steve) Peltier of Lake Fenton, and Leane Ceresia of Grand Blanc; brothers-in-law, Joey (Dana) Ceresia of Linden, David Ceresia of Flint, and Tony (Lori) Ceresia of Detroit; and many nieces and nephews. He was preceded in death by his parents; and daughter, Angela Carnell. Tributes may be shared at www.sharpfuneralhomes.com. To send flowers or a remembrance gift to the family of Daryl Alan Miller, please visit our Tribute Store. "Email Address" would like to share the life celebration of Daryl Alan Miller. Click on the "link" to go to share a favorite memory or leave a condolence message for the family.